finds a largest k-clan in the graph g.
finds a k-clan containing at most n vertices. finds a k-clan containing exactly n vertices. finds a k-clan containing between nmin and nmax vertices. finds at most s k-clans. finds k-clans that include the vertex v only. A k-clan is a k-clique where the diameter of the corresponding subgraph is at most k.
FindKClan returns a list of k-clans. FindKClan will return an empty list if there is no k-clan. FindKClan[…,k,nspec,All] finds all the k-clans. FindKClan works with undirected graphs, directed graphs, multigraphs, and mixed graphs. FindKClan finds one or more k-clans in a graph, returning them as a list of vertices. Here, a k-clan is a k-clique such that the graph diameter (i.e. 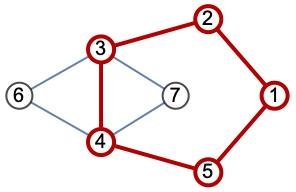 the length of the longest possible path between two vertices) of the subgraph induced by the vertices is at most k. k-clans are used in project selection, pattern matching, finance, and network analysis. In contrast, FindKClique can be used to find k-cliques of different subgraph diameter, from 1 to the largest possible size (in general n for a graph on n vertices). FindKClique can be used to find a single k-clique of specified subgraph diameter, a specified number of cliques, or all. 1-clans are cliques. All k-clans are k-clubs and k-cliques, but the converse is not always true. Related functions include FindClique, FindKClique, FindKClub, and FindKPlex.